Health regulator Monitor is investigating a £100m contract between NHS commissioners and a hospital trust. Commissioners named the Royal Devon and Exeter as the trust to provide care for the east of Devon in November. The Northern Devon Healthcare NHS Trust, which currently provides the area's services, complained about the decision, prompting the investigation. The trust said the decision was "made at the wrong time and made in a potentially flawed way". NHS Northern, Eastern and Western Devon Clinical Commissioning Group (NEW Devon CCG) did not put the contract out to tender before naming the Royal Devon and Exeter NHS Foundation Trust as its preferred provider of community services. It is not known when the contract will be awarded but NEW Devon CCG said it would follow a "process of detailed due diligence and contract negotiation". Monitor said it will review the decision-making process to ensure it was run in the best interests of patients, in accordance with the rules on procurement, choice and competition. Catherine Davies, from Monitor, said: "We have taken this case on because it may provide valuable lessons for the rest of the NHS as it tries to come up with new models of care to meet the many challenges it faces." One of the controversial aspects of the Health and Social Care Act 2012 was its emphasis on increasing competition in the health service, giving more private firms the chance to run NHS services. NEW Devon's decision not to put community healthcare out to tender raised eyebrows. But the CCG said handing the eastern locality contract to the RD&E would offer much-needed "joined-up" care to the local population, and the interests of patients trump NHS competition rules. However, others may complain that awarding contracts without an open process is not in the interests of a transparent and accountable NHS. Monitor's ruling will be closely watched. Dr Alison Diamond, chief executive of Northern Devon Healthcare NHS Trust, said: "We are of the opinion that the CCG's decision is the wrong one for patients and the health system, made at the wrong time and made in a potentially flawed way." Dr David Jenner, a GP from Cullompton and chairman for the eastern area of NEW Devon CCG, said: "We welcome Monitor's investigation into the contract award and remain confident that our decision is the right one." 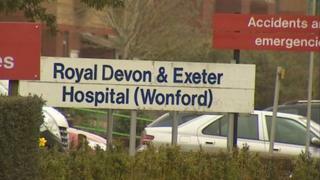 Angela Pedder, chief executive of the Royal Devon and Exeter NHS Foundation Trust said she hoped the investigation would be "completed without delay to minimise the impact on patients in the eastern locality of Devon".